To make baking soda pouch (prep ahead or have one teammate do this – Teammate #5, depending on age group): Measure 1 rounded tablespoon of baking soda into a square of single ply toilet paper. Fold horizontally and secure with a small piece of tape, then fold vertically and wrap it all the way around with a large piece of tape, ensuring it will stay closed. Make 1 per group. Break students into 4-6 groups, ideally 4 to a group so everyone has a job, depending on class size. Teammate #4 lift bag, allowing chemicals to mix. Shake 3 times, place in pan/bowl and observe what happens! 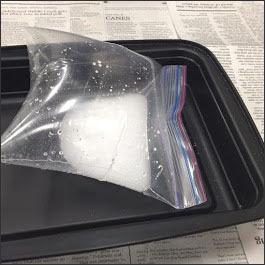 When the baking soda and vinegar mix, it results in a chemical reaction that produces carbon dioxide (CO2) along with water (H2O) and sodium acetate. If the bag is properly sealed, the carbon dioxide is trapped and fills the bag until it cannot hold any more, at which point it pops!